Survive the Storm is live August 29! Gather resources and build defenses during the day and fight to survive the night. The longer you go, the bigger your rewards. Can you make it to the end? Earn a unique banner for conquering each of the survival mode difficulties. Mutant Storms apply modifiers to both husks and heroes. Husks can be faster, stronger, heal other enemies upon death. Collect Storm Tickets to purchase limited-edition llamas that contain the new Hydraulic Weapons, heroes, and defenders. All Mutant Storms drop storm materials like Pure Drops of Rain. We revamped the ambient storm audio mix to ensure players have proper warning. Introducing the new Hydraulic Weapon set! Complete the Survive the Storm quest “Fortnite for a Fortnight” to unlock a transform key that will grants you the Hydra Hydraulic Assault Gun schematic. Collect Storm Tickets by surviving Mutant Storms or playing your way through the new Survive The Storm mode. 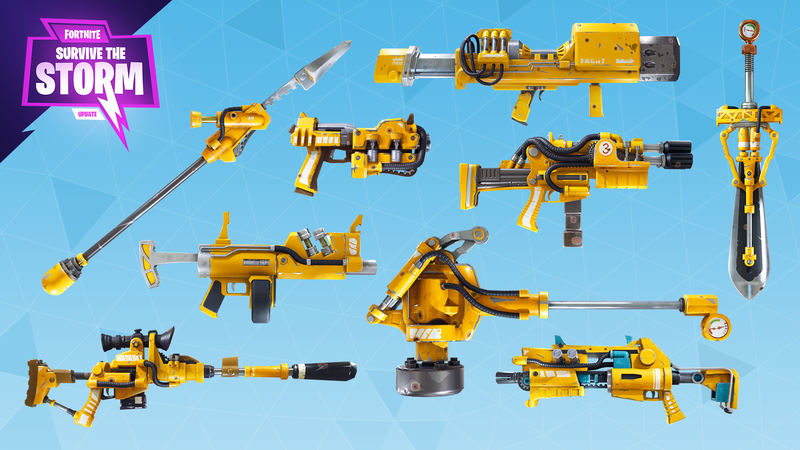 These Hydraulic Weapons can be found by cashing in those tickets for Storm Llamas. Introducing four new, exclusive Survive the Storm Heroes. Introducing two new exclusive defenders to help protect your fort! Tweaked the timing on the regular attack animation for the Sledgehammer. Complete a Ride the Lightning mission to celebrate with Lars in the updated victory cinematic. A NEW MONSTER – BEWARE! There’s a new prototype enemy lurking in the mists – the Shielder! Shielders strengthen other monsters by supporting them with a protective barrier. You’ll have to take out the Shielder first or blast through his tough defensive bonuses if you want to take down their husk pals. Homebase power has a new visual design to better indicate its adjusted level when you join a party. New messaging system implemented to better communicate that a player has become more powerful when Homebase power has increased. Added VFX and Audio to better indicate Homebase power has increased. Bonuses from the Support and Tactical hero squad members are now clearly shown, and explain how to unlock Tactical bonuses. Mission defenders now show their perks. Survivors Squads now communicate which F.O.R.T. Stat they provide. Now use the appropriate details panel. Chests and rewards open faster after completing a mission or quest. Crafting ingredient icons are larger and we have added corresponding tooltips. Polished and corrected a number of issues with the Daily Rewards screen. Schematic perks now show their quality level. Pickaxes will now properly scale damage at higher levels. Fixed an issue which prevented card packs from opening (but remained in the player’s inventory). The sands have shifted! 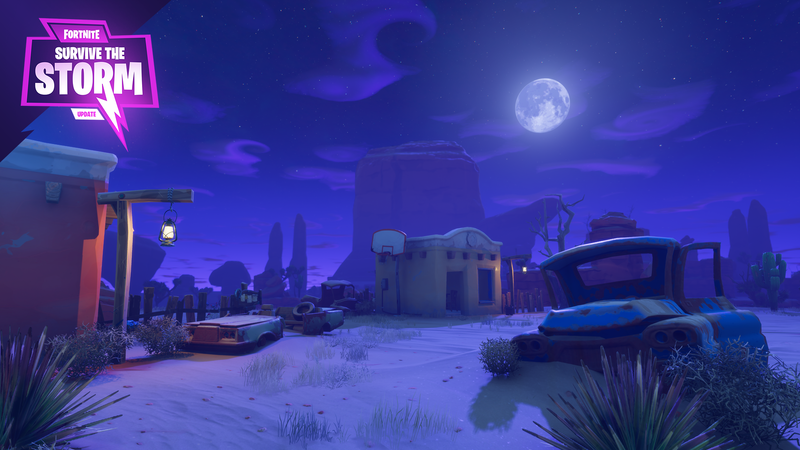 Those brave enough to have already reached the Canny Homebase Storm Shield will be rewarded with new environment visuals. We have not reset any Homebases, so there may be some visual artifacts that cause clipping around the map. Feel free to harvest these resources and get them out of your way. 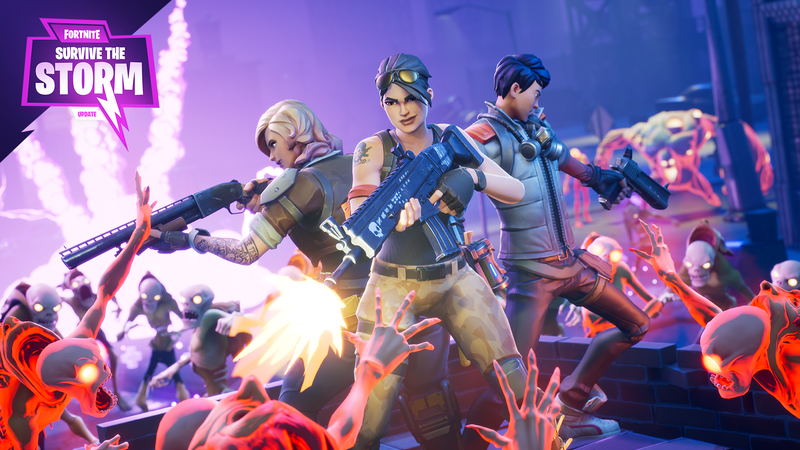 Players no longer need permission to use the Constructor BASE ability and Outlander Fragments. The Constructor BASE ability no longer counts toward the building total. 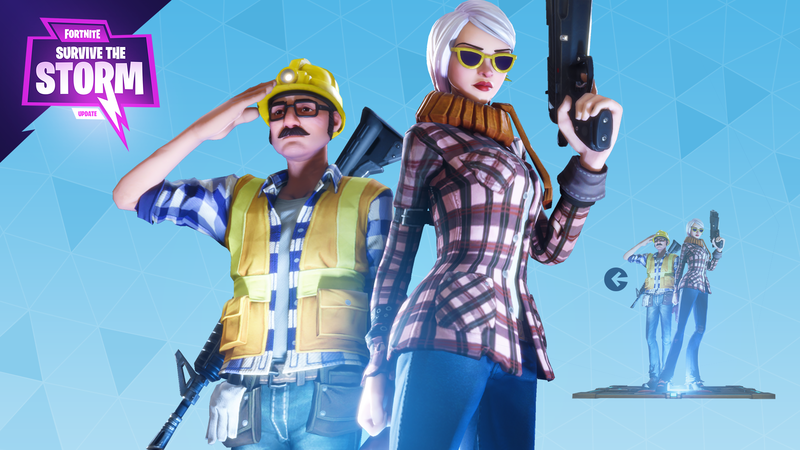 Since the launch of Fortnite, we’ve adjusted a number of features and improved game stability. We are making a few corrections to compensate players appropriately. For every 100 unspent Founder’s Coins still in possession, each player will automatically receive a Founder’s Llama, located in the Loot Tab. Players who have completed quests that grant Survivor XP will get additional Survivor XP to match the new values. Players who have completed the Launch the Rocket quest in Stonewood will receive an additional 10 Drops of Rain. Players would sometimes not receive their rewards from Transformation or Quests. All players who have failed to receive rewards in the past will receive their rewards in the form of special llamas, located in the Loot tab. Increased reward scaling with difficulty throughout all zones. Increased the XP reward scaling when opening higher level chests. Players who have already completed this Quest prior to this update will also receive this additional reward. Reduced Ore and Crystal quest reward quantities to match expected crafting costs. Increased survivor XP quest rewards. Players who have already completed these Quests prior to this update will receive additional Survivor XP. Fixed an edge case issue causing players to not receive V-buck quest-rewards. Party Finder does not populate newly added PSN/Xbox Live friends while Fortnite is running. Purchasing the Weapon Transformation node now unlocks “Transforming” in the Armory. Player options do not function in chat. This issue is only affecting console players. The “Resistance” Node (in lower right corner) is now unlocked once the Team Resistance node is unlocked. The “Outlandish!” and “Dragon Slash!” Trophies/Achievements are sometimes not awarded upon unlocking prerequisite skill tree nodes. The modifier name for “Powerful Assault Rifles” is listed as “Storm Assault” on the hex map. The modifier name for “Shared Hero Damage” is listed as “Empathy” on the hex map. Setting dialogue volume to zero will cause subtitles to be skipped. Players retain full character movement while chat is highlighted // selected. Mouse cursor is sometimes invisible on PS4. Keyboard and Controller are not bound to chat while the chat window is active. Loot Llama quest completion may be delayed after claiming prerequisite Upgrade Llama loot. Female survivors sometimes say male survivor voice lines. The Bluglo counter on the in-game HUD is sometimes inaccurate when a player is in a party. Bluglo is not saved when players rejoin a game in progress from the Abandon / Rejoin menu. Bluglo models sometimes stretch across the map. Players have to click “Apply” and “Close” after changing their Banner. Skill tree videos do not load until selected a second time. Purchasing the Weapon Transformation node does not unlock “Transforming” in the Armory unless Survivor Transformation is purchased as well. Onboarding and Storm Shield cinematics do not obey volume sliders. Items removed from overflow are not able to be slotted into the collection book . Backing out of the Collection Book menu and retrying fixes this issue. Upon accessing the Vault tab, the first item is selected by default. Made “Selected Building Type” key binding also copy the highlighted building piece’s configuration. Updated live streaming quest rewards. Replaced 500 Hero XP reward with 1 Mini Llama. Subscriber Quests now award 1 Mini Llama plus 100 Storm Tickets. Improved load times on Mac. Adding a second EMT Survivor and Fire Team Alpha Survivor into the initial “Unlock Survivor Squads” node. Four slots in which Survivors can be placed are now available very early in the skill tree. Changed how stagger/stun/knockdown resistance functions for mid-sized enemies (Husky Husks, Blaster, Flinger). We increased the rate at which enemies regenerate Stability to partially compensate for this change. Adjusted several of the lighter, faster-firing Shotguns so that they stagger enemies instead of knocking them down. Especially if the enemies hit are not at close range. Increased the impact dealt by most types of Assault Rifles and Pistols. You can no longer increase the durability of Explosive weapon schematics. Durability improvements on existing explosive weapon schematics have been replaced with increased damage improvements. “Play with Others” matchmaking improved. Previously did not load you into a mission. The Quick Play option now places players into the zones with the highest power level they are eligible to play in. The same applies for mission alerts. The Custom option allows players to select a difficulty . It defaults to the difficulty range that matches the current party homebase power. Reduced the cost of many transformation recipes. Piles of refined wood/stone/metal now drop more materials based on their size. Improved loot from defending downed satellites. Reduced Ore and Crystal quest reward quantities across the board. Evolving basic survivors will now require less Drops of Rain and other materials. Significantly increased reward scaling with difficulty throughout all zones. Increased experience reward scaling when opening higher level chests throughout all zones. Increased Survivor XP Quest Rewards across the board. Players who have already completed these Quests prior to this update will be granted the additional Survivor XP. “The Van or Astro-van?” Quest now awards 10 Pure Drops of Rain in addition to the existing Jump Pad rewards. Replaced the Handmade Ruler Sword schematic with the Handmade Semi-Auto Handgun schematic as the tutorial reward. The “Ride the Lightning” quest now awards the Handmade Ruler Sword schematic in addition to the Handmade Healing Pad schematic. Weapon/Trap Evolution tutorial quest now becomes available after “Van or Astro-van?” Quest is completed. Increased the recommended build limit in Repair the Shelter and Evacuate the Shelter missions by 25. Primary Mission icons are now more clearer the full-screen map. Fixed a PS4 crash caused by redeeming a friend code while signing up for a new account. Fixed a rare Xbox crash caused by suspending Fortnite. Fixed a crash that occurred after leaving and re-entering a zone repeatedly. 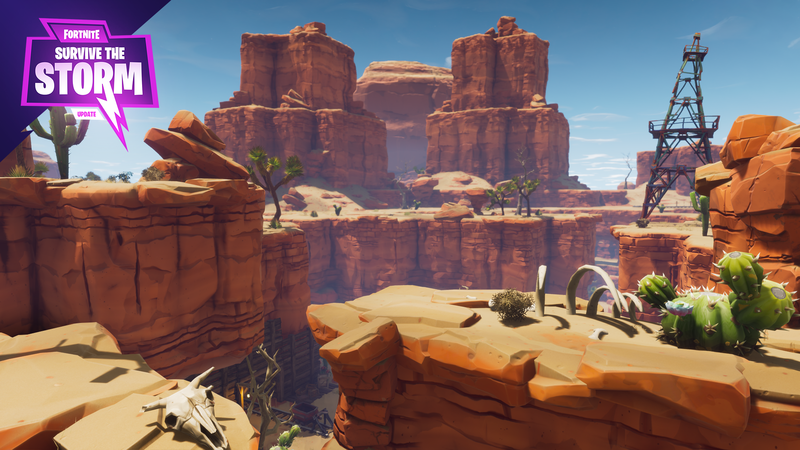 Fixed multiple client crashes that occurred during Canny Valley “Retrieve the Data” missions. Fixed an issue where the client would crash after Husks would spawn from ground rifts. Fixed an issue causing the Mac client to crash after clicking on the onboard loading screen. Fixed some instances of players not automatically rejoining parties following XMPP connection loss. Fixed an issue causing too many safes to spawn in the Bank vault. Fixed a bug where players would not receive the correct rewards if they completed a quest that had expired while they were playing a mission. Fixed AI pathing issues on player built forts. Fixed an issue causing a delay on husk spawns. This issue caused encampment encounters to only spawn a few husks at a time with long delays in between each spawn. The Bull Rush shield now appears to all players in the mission, instead of only the player using the Bull Rush ability. After being revived, a player’s character would fire automatically, causing uncontrolled loss of ammo. Fixed an issue preventing weapon transformation from granting any items upon completing the transformation. Fixed a rare bug which caused players to enter a mission with low health, no stamina and no shields. Fixed an issue preventing the Space Pistol from registering shots on propane tanks or head shots. Fixed an issue where Husks could be pushed // relocated into the game’s environment. Fixed an issue preventing quests “Enter the Ninja” and “To Boldly Go” from completing even after fulfilling quest requirements. Fixed an issue causing a player who used the Shockwave ability without enough room above their character to become unresponsive. Fixed a bug which caused some loot containers to appear as default orange meshes in Storm Shield levels. Fixed an issue preventing V-buck quest-rewards from occasionally not rewarding players appropriately. Fixed an issue preventing some pickups from being visible in the world when joining a game already in progress. Other players’ banner gadgets were occasionally invisible or displaying the incorrect banner when joining a game in progress. Updated Loot Llama Quest’s description. Now points players towards the Loot tab instead of the Store. Bottle Rocket projectiles no longer have collision with enemy Husks. The Airstrike ability can no longer be interrupted by attacks, and the number of bombs dropped will now always be the same. 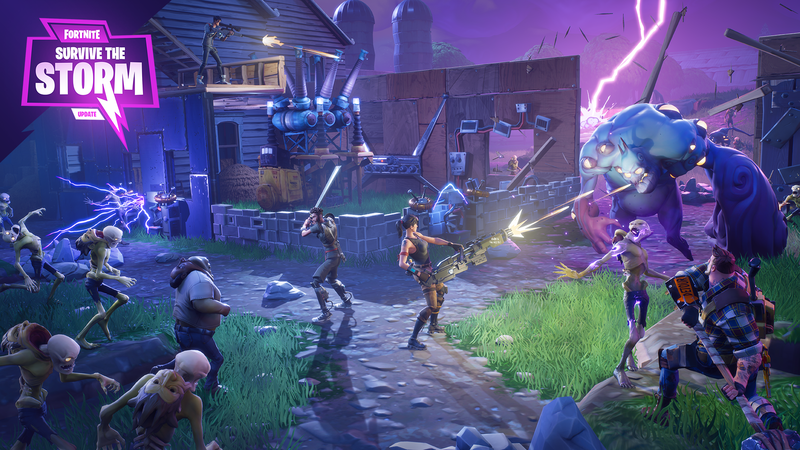 Fixed various issues preventing players from logging into Fortnite. Fixed an issue on Xbox where players couldn’t create an Epic account due to a website’s security certificate. Fixed an issue causing the theater pin to default to Stonewood, regardless of what was actually selected. Fixed an issue preventing players from progressing past the loot llama quest. Fixed an issue where Founder’s Chat wouldn’t appear after purchasing a Founder’s Pack on Xbox. Corrected an issue causing Bluglo pylons to spawn next to objectives, preventing proper defense building. Fixed various compiling errors on PS4. Fixed an issue where players would be stuck in a “Traveling to Lobby” state indefinitely. Fixed multiple issues preventing players from connecting to servers. Fixed an issue preventing muzzle flashes from appearing while firing a weapon. Fixed an issue that caused players to be placed in inappropriately leveled games when searching in Quick Play. Fixed an issue causing the ending cinematic for the “Deliver the Bomb” mission to freeze, making the mission impossible to complete. Fixed an issue causing the bomb launcher to never spawn in the “Deliver the Bomb” mission, making the mission impossible to complete. Fixed an issue that caused an error message to appear while authorizing a player’s Twitch account. Fixed an issue that caused the incorrect subtitles to display during various mission. Fixed various issues that caused subtitles to sometimes not appear on various missions. Fixed an issue preventing players from gaining energy back while shooting an enemy. Fixed an issue causing Daily Rewards to disappear if a player’s controller disconnected on the Daily Rewards screen. Corrected an issue causing pickaxe damage to not properly scale at higher levels. Fixed issue causing dialog to repeat when Ray located the launchpad in the “Van or Astro-van?” quest. Fixed an issue causing dialog to play after a mission failure. Players would sometimes not receive their rewards from Tranformation or Quests. All players who have failed to receive rewards in the past will receive their rewards in the form of special llamas in the Loot tab. Outlander’s Shocktower has been rebalanced to have an increased fire rate as well as do more damage and impact to all enemies hit. Fixed a bug that would cause Piercing Stars to sometimes strike the same target multiple times as the throwing star passed through. Players can no longer retire PlayStation Exclusive Heroes. Adjusted the Soldier’s grenade ability’s throw arc while holding a grenade launcher weapon. Fixed an issue which allowed the Outlander’s Phase Shift to be interrupted by the Smasher’s charge ability, causing the visual effects to stay on the screen. Fixed an issue causing the Soldier’s grenade ability to become unusable if thrown off of a cliff. Abilities that involve object placement, such as the Constructor’s B.A.S.E. ability, are now usable even when a player does not have Storm Shield building permissions. Fixed an issue preventing the the smoke bomb ability from activating, but would still cause it to go on cooldown if the player switched weapons during the ability. The Dragon Slash sword is no longer visible when the Ninja is in Shadow Stance. Ninja Throwing Stars now always fly straight forward, even when the Ninja is close to an enemy while throwing them. Fixed issue causing the player’s character to become unresponsive if the player upgraded a floor while using the BASE ability at the same time. Corrected the Mantis Leap ability so that falling damage does not apply if the second jump occurs at a low height. Fixed an issue causing the Phase Shift ability to play a Loot Llama voice line when activated. Updated descriptions for all tactical bonuses so they are more consistent, and clearly state their bonuses apply to the primary hero. Fixed several Trailblazer Quinn hero cards that were missing their tactical bonus. Fixed an issue that caused the Ninja to take full fall damage even after using the Mantis Leap. Fixed a bug that would cause Piercing Stars to sometimes strike the same target multiple times as the throwing stars passed through. Fixed a few issues causing homebase banners to appear backwards during Mission Rewards. Fixed an issue causing the sword from the “Dragon Slash” ability to remain visible even after use. Fixed a variety of texture issues on PS4. Fixed an issue that caused clipping through the player when a rocket launcher was equipped. Fixed an issue preventing the trail of visual effects from appearing when using the “Tail of the Dragon” ability. Fixed an issue causing the female Outlander’s Mask to cause clipping. Fixed an issue allowing players to manipulate card pack reveal effects with a controller and cause it to jitter back and forth. Enemy patrols now spawn from the giant storm vortex. Improved the lighting on a large number of trees and plants. Movement caused by wind direction has been adjusted for several plants. Smoothed out animation for Lar’s van when the apparatus is first placed. Retrieve the Data missions have a new loading screen. The computer quest objective found in the very first Fight the Storm mission has been updated. The art for the server room in Vinderman’s lab has been updated. New and improved visual effects for the Blaster. Weapons with elemental alterations now use elemental impact effects. The “Trap Parts” quest item has new artwork. Mini Llama is back to her old self, and, once again, werewolf proof. Improved Collection Book quest descriptions. The join and invite options will no longer appear when PC players select an Xbox friend in the friends list. Added tooltips for hero abilities on the hero squad screen. “Select quantity” slider is now easier to see. The “PRESS ANY KEY” screen has been removed from the PC version of the game. This ensures a timely login flow when Fortnite is run from the Epic launcher. The “Preparing: Checking for update” message will now be displayed when initiating matchmaking. This will help diagnose when there are problems checking for updates before starting matchmaking. Corrected an issue that caused Homebase Rating to add up incorrectly when partied up. Previously, Homebase Rating assumed that players were receiving more stats from their party than they were in reality. Players may notice that when partied, their Homebase Rating does not reach the peaks that it did prior to this change. Rest assured – your account has not lost any actual power that you’ve accumulated! Players can now move the camera on the mission map after they’ve zoomed in and then zoomed out. Error message model is now used for tutorial notification messages. Boat expeditions no longer appear before a player hasn’t unlocked boat expeditions. “Ready to level” and “favorite” icons no longer overlap. Hero and gun models no longer disappear in Schematics UI after completing upgrade quest. Updated tactical perk icons on several Ninjas. Unlocked Hero perks no longer appeared greyed-out on the Inspect screen. Fixed an issue preventing players from progressing past page 7 of the Plankerton Quest on the home screen. Fixed an issue that caused quests to display the wrong quest icon. Fixed an issue preventing global chat from closing // phasing out after sending a message on PS4 and Xbox. Defender cards will now have text on them when choosing them from a choice pack. Fixed an issue that caused weapon stats to disappear in the Armory tab. Added several Crystal Rare Weapons that were missing from the Collection Book. Fixed an issue that allowed players to enter their inventory screens while down but not defeated. Fixed an issue causing card packs to shake and glow brightly while opening. 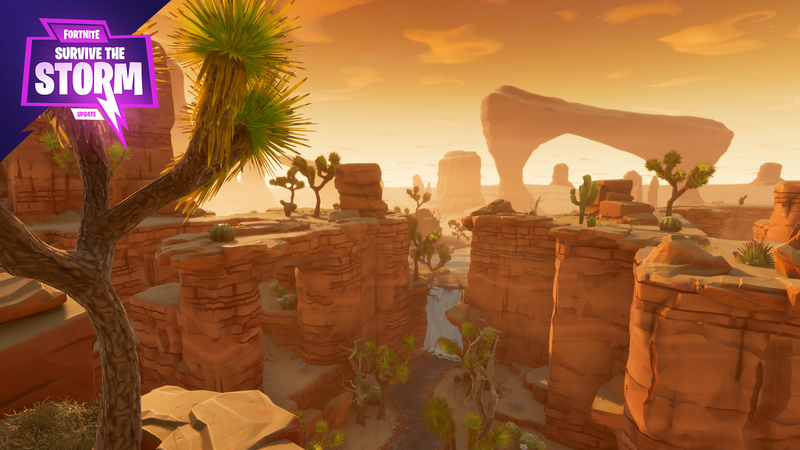 Fortnite was previously set to an incorrect viewport size when running in windowed fullscreen mode. Improved screen fades for full screen mode transitions on Mac. Fixed typo on Hero Stats page. Fixed a rare issue where connectivity problems to Epic’s chat service could trigger excessive retry attempts, causing instability for those users after several hours. Improved reliability of Founder pack redemption during service outages. 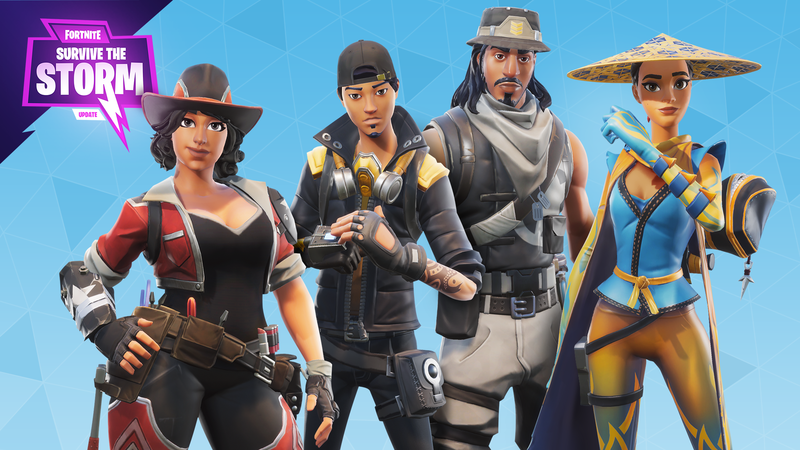 Game services should now recover properly and let players into Fortnite once the service recovers. Certain actions are now allowed to be bound to the same key, as long as those actions do not conflict. Fixed a bug where ESC key allows players to cancel matchmaking when travelling to the lobby. ESC key no longer cancels in this instance. Fixed an issue preventing the quest journal from updating when a player finishes a main quest and progresses to a new one. Fixed a bug causing frontend quests to get stuck in an endless loop while loading into a lobby. Fixed alterations not being applied for Trap critical chance in UI. Fixed incorrect defender stats in the Frontend UI. The Ninja’s “Anatomy Lessons” perk now updates the weapon’s critical hit chance in the tooltip. Fleetfoot Ninja’s vault movement speeds will now appropriately reflect the “Fleet” movement buff. Added clearer player feedback messages when attempting to edit / improve / damage buildings when Storm Shield permissions are restricted. Fixed an issue preventing evolved weapons, defenders or traps from gaining the appropriate stat bonuses. Fixed an issue causing character models to appear in a broken state on the Upgrade/Inspect screen. Fixed an issue preventing usernames from appearing. Fixed a typo in the “Loot Llama” description. Fixed a typo in the “Corrosive Stars” perk description. Fixed some incorrect hero display names. Leaving a zone will no longer cause a player’s power rating to be shown as zero. Locked alterations will no longer apply to weapons in tooltips. Healing pads will now show the correct amount of health gained per heal while leveling up. Fixed a crash when interacting with a UI message. Fixed HUD reticle not always respecting HUD visibility settings. Ammo Cost differences now appear properly when upgrading or comparing weapon schematics. Improved recovery speed when player is disconnected from global chat and attempting to rejoin. If social features are unable to connect at startup, your connection will retry every few minutes until it succeeds. Corrected a number of localization issues. Daily rewards will no longer disappear if your controller disconnects. Players will no longer losing input control on error screens. Theater pin name will no longer default to Stonewood. Corrected several quest icons in the front end. Fixed issue where daily rewards were not automatically displayed on login. Fixed an issue that prevented players from removing items from the storm shield storage if it is a maximum capacity. Fixed an issue causing the Homebase banner icons to appear mirrored if they appear on the left side of the victory screen. Fixed a number of issues on the upgrade/inspect screen where items were overlapping each other. Fixed an issue that prevented players from claiming completed expeditions right away. Fixed Rewards window so that it can display longer text. Corrected incorrect keyboard shortcut ties to the research points “collect” button. Fixed an issue that allowed players to assign multiple conflicting actions to one key. Fixed issue on Defenders screen – Armory. Now sorts defenders by name instead of sorting them by Rating. Transform tile will now show alerts in the Armory. Expedition and Quest alerts now clear on hover. Fixed grammatical error on “Team XP Boost” text description.